Can you be the next Wade McGilberry? Don’t remember Wade? 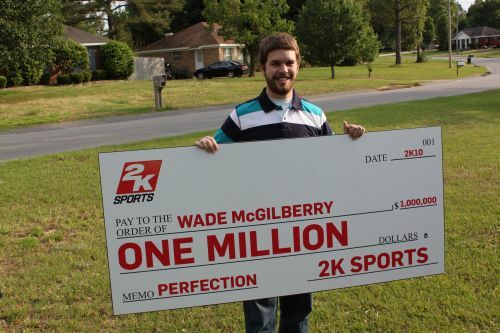 Well, last year he won $1,000,000 from 2K Sports by being the first person to pitch a perfect game in MLB 2K10. 2K Sports is at it again with MLB 2k11‘s Perfect Your Game challenge. While all of the official rules aren’t out yet, it can be expected that they will be roughly the same as last year. Most likely you’ll need to use a camera to record yourself playing in the ever changing MLB Today mode. After pitching a perfect game, you’ll need to burn a DVD of your performance and send it into 2K Sports or Twin Galaxies, their official record verifier. For all the official rules head over to 2K Sports’ Perfect Your Game page. It may seem like a lot of work, but for $1,000,000 it seems worth it. As with last year, even though Wade pitched the perfect game on the day of its release, 2K kept it under wraps until May, to try to push sales by giving people a false sense of hope. Wade thinks it was worth it. After a year of Major League Baseball where Dallas Braden and MLB 2K11 cover athlete Roy Halladay both threw perfect games, lets not forget Armando Gallaraga’s notable nearly-perfect game, its a pretty good guess that the first perfect game of MLB 2k11 will be pitched on launch day. If you’re up for the challenge, we wish you luck, if you happen to throw one, let us know in the comments below. While MLB 2K11 releases on Xbox 360, PS3, Wii, PSP and DS on March 8th, this competition is only available to Xbox 360 and PS3 players. With sports video game franchises seemingly dropping off every year, its rare that we get a true cover athlete showdown. Thankfully, Major League Baseball has graced us with two top of the line players this year. 2K Sports has chosen Philidelphia Phillies ace and 2-time Cy Young Award winner, Roy Halladay to be their cover athlete for this years MLB 2K11. On the other side of the fence, Sony has decided to bring back Minnesota Twins superstar catcher Joe Mauer to be their cover athlete for MLB 11: The Show. While waiting for the games to come out to decide which is better would be the logical thing, how bout we make a decision based on on the field results? So what happens when a 7-time All-Star and 2-time Cy Young Award winner faces off against a 4-time All-Star and 2009 AL MVP face off? As the saying goes “good pitching always beats good hitting”. The good news is that with Halladay in the NL full time, Mauer won’t have to face him as often. 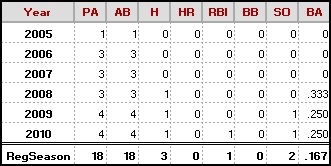 Though, maybe Joe just needed more ABs against Halladay. Aside from Rangers pitcher C.J. Wilson (.053), Mauer has a better batting average against any other pitcher he’s faced more than 18 times. From these numbers is looks like MLB 2K11 has won the cover athlete showdown. 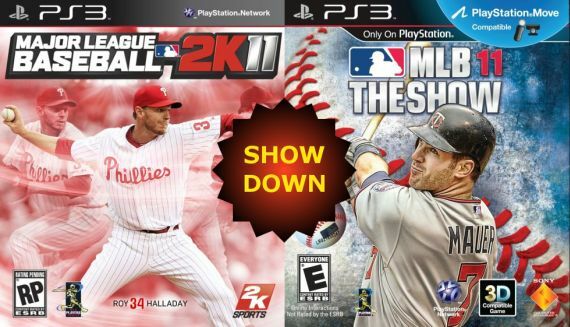 The question is, will MLB 2K11 be a better game than MLB 11: The Show? We will find out soon. MLB 2K11 comes out for Xbox 360, PS3, Wii, DS and PSP on March 8th. MLB 11: The Show comes out for PS3, PS2 and PSP on March 8th. Hello and welcome fans, I’m Ally McCoist. No actually I’m not. I’m T.J. Lauerman and this is ThatSportsGamer.com. Along with some friends of mine, we are going to try to bring you something enjoyable to read about the world of sports and sports gaming. Hopefully you’ll stick around, enjoy, and even drop us a line on how we can make the site the best it can be.